Netflix, chill, home beers and slippers. Can pubs possibly compete with the comforts of the modern home? There’s a website you can check to find out about pub closures in the UK. Stark and utilitarian, closedpubs.co.uk scratches up another notch every time a pub rings its final last orders bell. Then, it dutifully eulogises the total to a grimly stoic congregation, who I’d imagine is made up primarily of journalists, beer bloggers and the people who submitted the Dead Pub for inclusion in the first place. “Archiving the decline of the English pub” is their unemotional tagline. Suitably bleak. It’s a useful resource, if a drizzly, reflecting-the-grimness-of-reality sort of one. Here is somewhere you can see data-based evidence of the pub-closing phenomenon, so often reported in CAMRA newsletters. It’s a perennial story in newsrooms too, useful if there’s nothing else to talk about. The general consensus is that people love pubs and they hate it when they close down. Nobody wants to see pubs closing. As well as being our surrogate living rooms, our pubs are part of our local heritage, and the space they take up on our high streets tells a story of our recent past. Seeing a pub close is sad. Maybe that’s because we know how important pubs are to our communities. Maybe it’s because closed locals are garish visual metaphors, serving to remind us that one day we too will cease to exist, and it bums us out a bit. Either way, it’s never really a cause for celebration. Did you really ever visit that pub though? Did the blackboards promising karaoke nights and £4 mini-bottles of Prosecco never hook you in? Now it’s gone, will you miss its gaudy carpets and the Deal or No Deal fruit machine by the loos? Or if you think about it, was the last time you were there eight years ago when you had four pints of Fosters and watched your mate’s band play one last time before he moved to Australia? According to figures published by CAMRA* around 18 pubs are closing every week - 476 in total from January to June 2018. Some of them were loved, and it’s a travesty. Some of them faded away without much of a fight. Why is that? Although it happened long enough ago for a lot of younger drinkers not to know any different, plenty of campaigners point towards the smoking ban as some sort of pub-closure harbinger of doom. At the time of the smoking ban in 2007, things were about to get a lot harder for pubs. We had an economic crash, beer duties rose by 43% between 2008 and 2013 and average real-terms pay ground to a halt. All this created a smoke-free hostile environment for boozers all over the country, and thousands wasted away, or were gutted and turned into sassy little apartments. So that’s one reason. Another factor is a change in attitudes. There really is nothing worse than a lazy story about millennials and our work-shy, kooky antics (millennials are aged 22-37, it’s not shorthand for “feckless youths”), but one particular generalisation rings true. There is an entire generation of adults who have learned that they prefer staying in to going out. After a hard week at work, how can a busy, slightly disappointing pub compete with a stash of your favourite beers, freshly-delivered pizza and a whole series of Glow? (Or Narcos, or that one about the rescue team at the Matterhorn, whatever you want). Pubs can be exceedingly great when they’ve struck the right balance of variety and vibe, but you know what else is great? Lying like an octopus in loungewear on your sofa, eating thousands of honey roasted cashews, wondering which coffee porter you’re going to pull from the fridge next. Some of them were loved, and it’s a travesty. Some of them faded away without much of a fight. And we like drinking at home. Social media has enabled us to communicate seamlessly with other beer fans and likeminded folks from the comfort of our favourite chair; like a pub in the palm of your hand. Sometimes I think if I could only find a regular supply of scampi fries within the confines of my hyggoth home, I might never leave. Is there really anything wrong with admitting that staying in can sometimes be better than whatever is on offer “out there”? Unless you’re fortunate enough to live in one of the country’s most shimmeringly exciting towns at the crest of the craft beer tidal wave, your local can be something of a damp squib. These are the pubs still relying on good faith that people will visit no matter what, whether they fix the locks on the toilet doors, clean their lines properly, and adapt their beer orders to suit demand or not. That’s not doing them any favours. There’s another serious note to the abandonment of pubs though: outside of the craft beer bubble, there are thousands of people who can’t afford regular pub-based pints. As a result, pubs who can’t keep their costs low enough to include them are closing. In their hundreds. 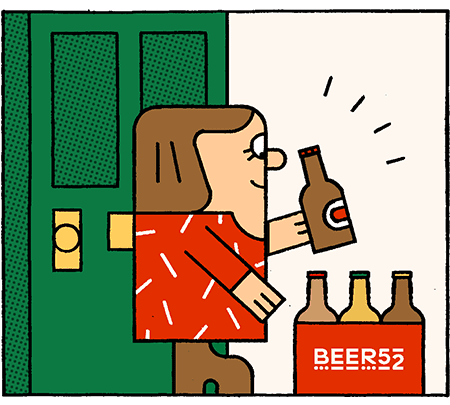 With special offers encouraging people to bulk-buy slabs of tinnies rather than a couple of pints, it’s easy to see why people on a budget choose to leave the pub behind. It seems like an easily avoidable cost. There’s plenty of evidence to suggest that the price of beer will only continue to rise too, thanks to the cost of ingredients and duties for brewers and publicans. It’s here that it becomes a question of value, rather than cost. How much do you value being able to drink a pint in your pub? Or does the beer you drink gain nothing from context? To some, it just doesn’t. As a pub-lover, this might seem a totally alien concept, but it’s a common feeling. Because of pub closures throughout the 90s and 00s, changing attitudes around social drinking (as opposed to the Big Night Out - a totally different concept) and poverty (which is a much wider issue than you might think), there are drinking-age people all over the country who’ve never felt the lure of an after-work pint because their parents didn’t either. In short, there are thousands of people out there who might see a pub closing down and think nothing of it. Why would pubs regenerate in these areas if there’s no demand? And how can the people who do love their local pub stop its inevitable decline? Some doomed pubs have been revived by social action groups, keen to improve their local, convinced of the pub’s status as a community keystone. Where traditional pubs have closed down due to disinterest, micropubs and taprooms are springing up to replace them. Some pubs have adapted to suit their customers, or been bought from breweries as freeholds, and they’re thriving, offering more choice and more welcoming surroundings. Beer popularity might have taken a dip in the middle of the Noughties, but it’s coming back strong, and with the tangential popularity of artisanal spirits like gin, vodka and liqueurs, these new versions of an old tradition are making sure that there will always be somewhere to drink on a Friday night. The business of drawing people out of their homes and back into the pub isn’t as easy as it used to be, but some landpeople are using their initiative and figuring out how to keep their bars open. It’s kind of bringing a full-circle feeling to the pub again, back to the olden days, when pubs doubled as a range of local resources to bring money in where they could. Maybe taking tips from some of the oldest pubs in the country could help keep our favourite locals alive? No matter what’s done in your area to keep the pubs open where you are, if you care about them, it’s important not to be passive. So, while you might want to stay in tonight - and that’s totally cool, so do I as it happens - the only way the option of going out will remain an option is to support your pub from time to time. A Sunday afternoon pint counts. Stopping off to grab some take-out cans for the train counts. Heading in to show your enthusiasm when they’ve put on a beer you like definitely counts. There are millions of complicated reasons why a pub might close. Sometimes they deserve it. Often, it can’t be stopped. But sometimes, all it takes is a bit of support. There’s been a pub on this site since 1251, so it shows that the location is pretty good for footfall. As well as a pub, this historic local is also a display unit for an axe used to execute the Earl of Derby in 1651 - who drank his last pint inside. So, add “dark tourism hotspot” to the list of potential money-makers. The idea of a DB&B deal isn’t a new one. This ancient pub has been serving meals, making beds and doling out tankards of ale since 1241, proving that diversifying into the food market can help to keep a pub open for ostensibly, a really long time. A Benedictine monk’s remains were found in the cellar in the 70s so perhaps adding a graveyard or catacomb to your local could be add a little longevity? This 1000 year old pub was once called the Priest’s Inn because as well as serving alcohol, it’s riddled with Priest Holes for hiding priests during their persecution in the 1600s. Oh, and it was a courthouse at one point too. Quite the diverse portfolio.